And so Majik and I decided to talk about the upcoming Firelands nerfs in this week’s episode. Apotheosis is looking for a TANK, check us out at http://www.apotheosis-now.com/main/! Choice of Skywall is looking for HEALERS and some DPS, check them out at http://www.choiceguild.com/! And please rate us up on iTunes! If you give us a review and a high rating, we’ll read your name and comment out on the show in the Shout-outs section! Four stars will get you a shout-out from Majik, five-stars gets you one from me! Don’t forget, we’re still accepting bumpers for the show, hit us up at podcast [at] blessingoffrost.com and if we like ’em, we’ll use them in the show! Episode 32 is here and brings with it some, er, “engaging” news in Majik’s life. We also have our first-ever show with two guests, Kaleri and Sara (who was previously on Episode 21 of Blessing of Frost) and we discuss chronic diseases (in particular, Crohn’s Disease and Multiple Sclerosis) in the context of World of Warcraft and how players with these conditions are affected by WoW or how their WoW playing is affected by their conditions. Apotheosis of Eldre’Thalas is seeking a tank! Prefer a warrior or a paladin, perhaps an exceptional DK or druid, but honestly, the Vanquisher token people might kill us for adding another person to their token. Apply now! 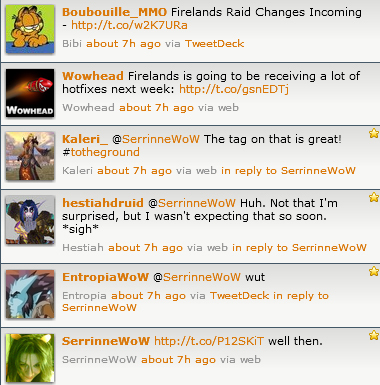 Sara’s Twitter: @SerrinneWoW – she especially would love to hear from you if you’re a WoW player who’s also been diagnosed with MS!